In this paper we present a technique for efficiently computing the reflection and transmission of light by arbitrary systems of turbid layers. To approximate the steady-state reflectance and transmittance without the need to solve difficult boundary conditions, we convolve the reflectance and transmittance profiles of individual layers. We extend single-slab boundary conditions to handle index of refraction mismatches between turbid slabs, and account for inter-layer scattering by applying methods similar to Kubelka-Munk theory in frequency space. 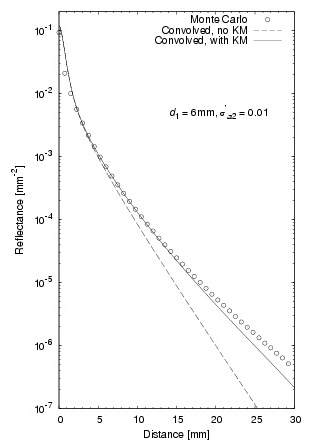 We demonstrate good agreement between the reflectance and transmittance predicted by our model and numerical Monte Carlo methods, and show that the far-source reflectance and transmittance of multi-layered turbid materials is dominated by inter-layer scattering. "Rapid simulation of steady-state spatially-resolved reflectance and transmittance profiles of multi-layered turbid materials".